Why choose Bed and Breakfast in Wellington Somerset? Wellington is just 2 miles from the M5 between Taunton and Exeter. Our family run Inn will provide everything you need to make your stay a pleasant one. Located in the far south western corner of the beautiful county of Somerset, the small but lively town of Wellington is set against an attractive backdrop of rolling hills and farmsteads. Its’ vibrant and eclectic town centre offers plenty of cafes, specialist shops and pubs for visitors to explore. There is also a well-equipped sport centre with fitness gym and large indoor swimming pool. Wellington has a history and a layout that dates back to Saxon times and a long association with cloth making. In the late 1700’s the Fox brothers built an elaborate system of small lakes, weirs, sluices and bridges to power their water wheels. The waterways they created now form part of the ‘Basins’ conservation area, which remains an important site for recreation, fishing and wildlife. The Fox brothers also gave Wellington its’ award winning town park. Now beautifully restored thanks to a Heritage Lottery grant, the park remains an important national example of late Victorian design. Wellington also has its’ own an original Art Deco cinema built in 1937 and named The Wellesley, after the Duke of Wellington. The Wellington Monument, built in honour of the Duke in 1892, is perhaps Wellington’s most famous and important landmark. 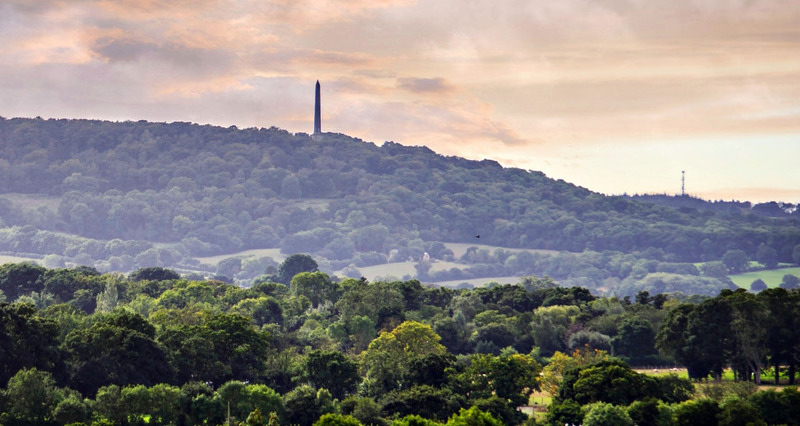 Situated on the highest point of the Blackdowns hills, this impressive obelisk is visible from many parts of the town and offers commanding views across the Vale of Taunton, the Bristol Channel and Exmoor. Travel a few miles in any direction from a Wellington Bed and Breakfast and you will come across many attractions and beauty spots. The Blackdown Hills rise just a mile or so from Wellington town centre. Peppered with pretty villages, farmsteads, lush fields and woodlands, this Area of outstanding Natural Beauty offers plenty of opportunities for walking and cycling. Steep ridges, high plateaus and valleys stretch deep into Devon and end not far from the beautiful coastal resorts of Lyme Regis, Sidmouth, Seaton and Beer. Wellington is also flanked to the northwest by yet another range of hills called the Quantocks. Also designated as an area of outstanding Natural Beauty, these wild, heather covered ridges stretch as far as the Somerset coast and the Exmoor National Park. Visit Somerset’s premier coastal resort of Minehead, just a 30 minute drive away, or neighbouring Porlock where Exmoor literally tumbles into the sea.